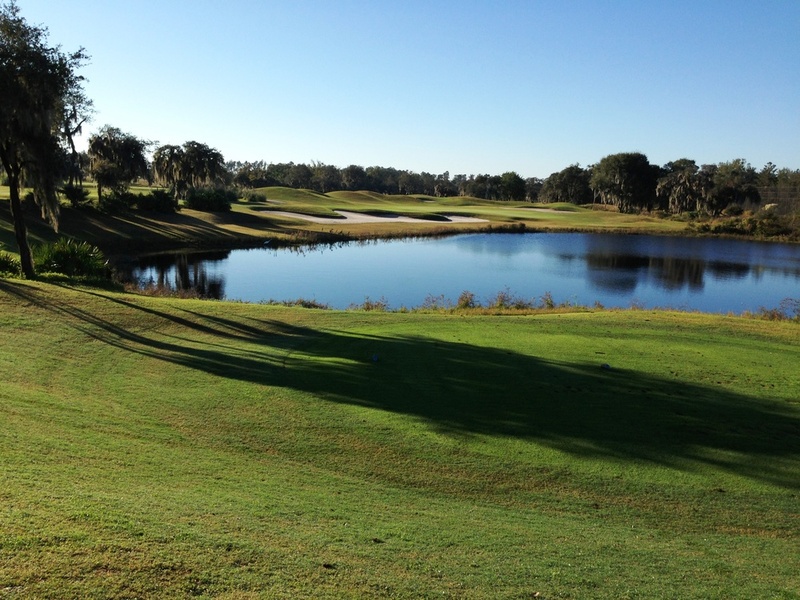 Golf course architect Clifton, Ezell and Clifton partnered with Landirr Inc. to build Venetian Bay located in New Symrna Beach, Florida. The goal was to renovate Venetian Bay into a Championship Golf Course. Many months were spent reviewing several iterations to achieve the final championship golf layout. While working and re-working the plans, it was always a matter of a 360 degree feel. As you turned the question was "what are we seeing now?" It was never about how many home sites can be garnished on the golf course but more of how we can offer the player a true feeling of being out in nature. As a result, we have no holes with development on both sides. The fact is, most of the fairways actually have none. To complete the course routing, we utilized a large state owned riparian corridor to the east of the property as a backdrop for the development. We brought the clubhouse well into the golf course off the collector road locating it in a centrist position to the playing field. Again, the 360-degree vista. We have plenty of staging area adjacent to the Pro-Shop, two practice greens and a beautiful driving range with eight target greens. All but two holes play in a north/south alignment so the sun is never a problem. The existing wetlands were isolated cypress heads scattered about this old pastureland. These offered opportunities to sculpt the holes over and around them creating interest, utilizing less land and framing many of the shots. Through patients and proper planning it equated to almost zero clearing on the golf course proper. We still have adequate sunlight and air flow on every hole to maintain a sustainable healthy golf course for years to come. With low flat pasture land such as this, it was important to create storm water ponds. Much of the course uses these ponds for shot strategy. We have several holes with risk/reward scenarios using these ponds and trees to tempt riskier angles. Another by-product of storm water ponds is sculpting material, which we used to our advantage. It was important for us to create a real WOW affect when driving into Venetian Bay to complement the beautiful architecture. We shaped in one hundred and fourteen bunkers throughout the course all plainly seen from tee or roadway. These were created and placed as more of a dramatic affect from the tees but not as penal as they may appear. It's more of a look hard play easier concept that keeps the golfers happy. We offer large softly rolling greens to enable maintenance staff many pin placements and to obtain faster stimpmeter readings in the range of 11 to 13 if desired for tournament play. The finishing holes are the main/hot topic of conversation in the clubhouse. Number nine is a very short par 4 (sometimes called a par 3 Y2). 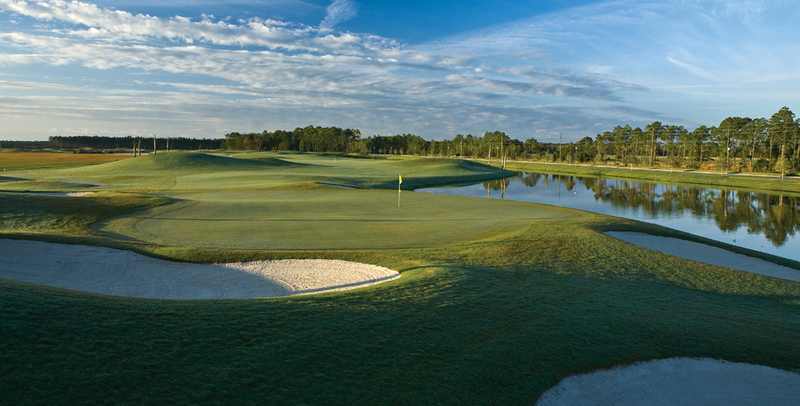 It offers a gutsy shot for the green over a cypress head but is well protected by staggered bunkering in front and an adjacent pond to the right of the putting surface. Play well; you've got spectators on the C.H. patio just a few feet away. Number 18 is a longer straight away par 4 with early bunkers to distort the depth perception off the tee, alternating bunkers along the fairway and then on to the green perched against the entry feature pond. This course is a true championship test of golf demanding every club in the bag. We're very pleased to see Venetian Bay has been well received by amateurs and tour players alike.